"My name is Bryan Mariscal and I have been a member of Pacific Crest for five years. This year I have finally aged out, and did so in Orlando as a semifinalist. 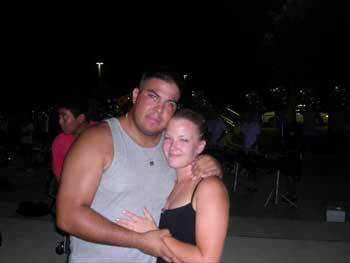 "This is a picture of myself (the big guy) and my girlfriend of three years, Stephanie Colby, who was also an age out. Every year before the final show, Pacific Crest gathers all the members and performs a concert in honor of the age outs. The age outs are pulled out of the arch and get to listen to the show played by our brothers and sisters. I am sure you can tell we are both a little emotional and proud of the show our corps put on." Thanks Bryan!